We’ll be using student learning folders/binders for the first time this year. The goal is for students to keep better track of their learning and take more ownership in the process. In addition, the folder will be directly tied to our new retake policy. Page 1 is the concept checklist for the course. Students will fill in their scores after we go over each quiz. Page 2 is the grading scale that we use to grade each quiz. The intention is for students to know what their grade actually represents. A grade of 70 means a student is emerging, and it’s important for them to know that instead of believing they’re just barely a passing student. Starting on page 3, the kids will place their first completed quiz in the folder after we go over it in class. We want them to keep their work for reference so they can analyze it and witness their progress as they retake assessments in the future. 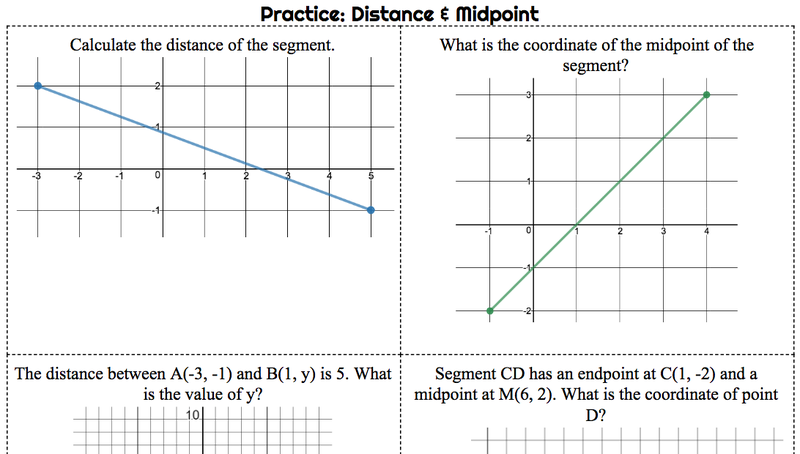 For Geometry, our first quiz is over Distance and Midpoint. The practice problems are the same as the ones from the quiz except with different numbers. I thought it would be helpful to keep the questions similar so that the kids can reference their quiz while working. This also gives incentive for the kids to follow along while we are going over quizzes in class. After placing the analysis handout in the folder, we won’t put more papers in until our next quiz analysis day (usually the day after we take a quiz). On the next quiz analysis day, students will place their new quiz in the folder and receive another analysis paper to put in and complete as well. 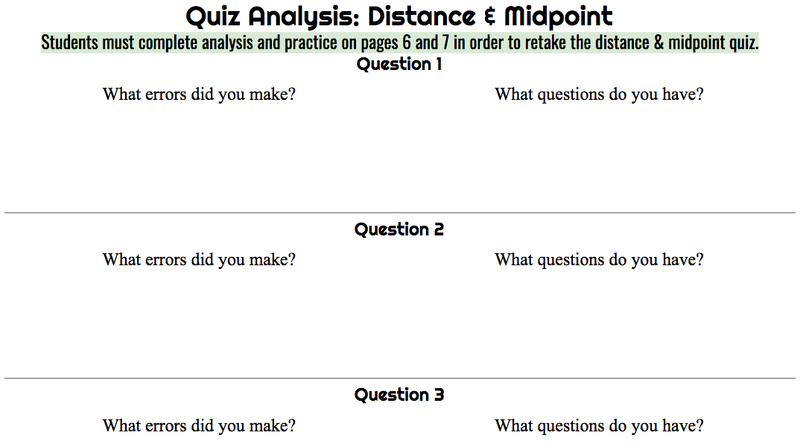 In addition, if a student chose to retake the Distance & Midpoint quiz, then he or she may receive an analysis form for the retake if they decide to retake a 2nd time. More on this below. To help clarify what’s written above, here’s a link to the contents of our Geometry folder (it’s not complete yet but shows the pattern). Students will be required to keep track of their folder in order to retake quizzes throughout the year. Here’s the vision. Teacher grades quiz and puts grades in personal spreadsheet. We go over quiz in class next day. Student receives and corrects quiz. In addition, student receives and completes analysis/practice handout. This handout can be completed any time before our next quiz day. The student only qualifies for a retake if the analysis/practice handout is completed and grade progress has been marked on his or her concept checklist. At end of class, students come up to teacher desk to see grade they made on the Distance & Midpoint quiz. If grades are easily accessible online or through an app, then students can choose to see their grades there instead. The teacher places the grades in the official gradebook system after class is finished. Student fills in concept checklist based on their grade and completes analysis/practice handout if they haven’t already. Student takes Angle Pairs quiz. Once finished with the quiz, the student is offered an opportunity to retake the Distance & Midpoint quiz only if they show the teacher a completed analysis/practice handout and marked progress of their checklist in their folder. Teacher grades Angles Pairs quiz and Distance & Midpoint retake and puts grades in personal spreadsheet. We go over Angle Pairs quiz in class next day, but we most likely will not go over the Distance & Midpoint retake because of time limitations and the fact that many kids will not choose to retake. Student receives and corrects Angle Pairs quiz. In addition, student receives and completes an Angle Pairs analysis/practice handout. This handout can be completed any time before our next quiz day. 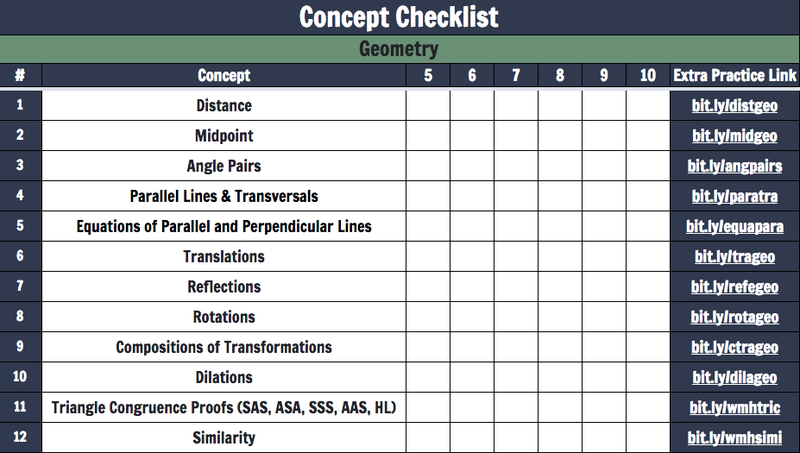 The student only qualifies for an Angles Pairs retake if the analysis/practice handout is completed and grade progress has been marked on his or her concept checklist. At this point, students may retake the Distance & Midpoint quiz a 2nd time at any point before the end of the grading period. However, they must complete an analysis/practice handout over their 1st retake AND come in for tutoring before retaking for a 2nd time. If a student decides that he or she wants a 2nd retake opportunity (this is rare by the way), then he or she will be given the analysis/ practice handout after the request. Also, we can go over their first retake together in order to see what was missed. Here are the contents for the folders. I haven’t started the Algebra 1 folder yet, and Geometry is in the beginning stages. Both will be updated over time.